If God has never thrown a potato at you, well, you just aren’t praying in the right way. Of course, the right way, in this case, is a very specific wrong way. One year ago today, or so Mrs S is informed by the Facebook algorithmic powers that be, Mrs S was in a particularly foul mood. She was tired and had a sore back, and was walking home after collecting C from nursery school, pushing N in the stroller, and wondering how she was going to make it the whole mile, with a tired three year old in tow, let alone make another two mile round trip to collect R in a couple hours’ time. To make matters worse, she had no idea what she was going to cook for dinner. Many days Mrs S only perseveres with the day because she is looking forward to dinner. As Mrs S walked, she fumed silently. Every idea she came up with seemed perfect, except for one missing ingredient. No tomatoes, or no garlic, or no chicken stock, or, repeatedly, no potatoes. Potatoes! Ugh. She was not going to the grocery store. No way. Not today. She doesn’t even particularly like potatoes. Just a hundred yards from home Mrs S’s internal whining turned into a vulgar sort of praying. “Why, Lord?” she demanded to know, “Why the hell don’t I have any potatoes.” Only, perhaps she didn’t use so genteel or spiritual a word as ‘hell.’ Perhaps it was a bit earthier, a bit more Anglo-Saxon. Suffice it to say it was not her finest spiritual communion. It is one thing to rant and rave to oneself, and to wonder in sweary solitary reverie how to feed one’s offspring without a ready supply of starchy tubers in the larder. It is quite another to curse at the Lord as one bemoans the bareness of the pantry. The Penitential Potatoes. The small one on the top left found its mark. Things could have been much worse. Now, Mrs S has always suspected it was her long-suffering guardian angel who actually took aim, but whatever the mechanism of its flight there was some almighty power behind that potato. It hit her plumb on top of the head and then bounced down to rest between her feet. Mrs S’s gaze flew to the passing tractor with its trailer overflowing of fresh potatoes that was rumbling past. 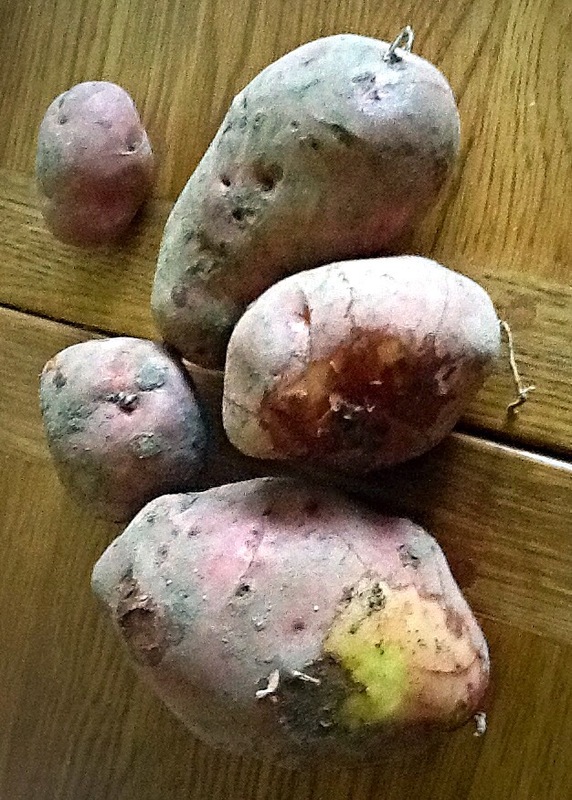 It hit a bump and four more potatoes landed in front of Mrs S, three of them of menacing proportions. It is a demonstration of the mercy of God that He answered her abominable prayer without killing, or even concussing, her. It is a demonstration of His justice that she had a pounding headache for the rest of the day, and of her reformed and penitential spirit that she didn’t demand to know why the hell that was. The family had a lovely stoved meat pie filled with the leftover Sunday roast and topped with the projectile potatoes, and a great deal of amusement at Mrs S’s expense. Mrs S remembers being taught that prayer is A.C.T.S., meaning that prayer is adoration, contrition, thanksgiving and supplication. “Lord, why the hell don’t I have any potatoes,” does not fall into any of these categories. In an attempt to form them in the faith, Mrs S has simplified the language for the little S children. There are four kinds of prayers you should say, she tells them: ‘please’ and ‘thank you’, ‘I’m sorry’ and ‘I love you’. (Incidentally, these are the four cornerstones of healthy familial relations as well.) This underlines the problem with swear-prayers. You might be tempted to think that “Why the hell don’t I have any potatoes?” is supplicatory, but good and proper supplication always starts with ‘please’, not ‘why the hell.’ In short, if you’ve been adoring properly, you’ll get the language right; if you’ve remembered the ‘I love you,’ you probably won’t start with an accusatory curse, no matter to whom you are speaking. Each family, each domestic church, has its own special feast days, and ways of celebrating them. Some are of broader significance and some are more private affairs. Tomorrow is the feast of the Nativity of Mrs S, and she does not imagine that everyone will be marking the day with sushi and rosé as she intends to, but the S children are all stirred up because there will be presents (and for most children it is as exciting to give a gift to someone beloved as it is to receive) and cheesecake. Special days are good pedagogical tool. Religious holidays come with ready-made lessons, because that’s how the Church calendar was devised: as a microcosm of human experience in relation to God, in a single year. Each day gives us something to think on. You could even say that the Church calendar examines and celebrates the action of God in the world. That is why this year, on the anniversary of the potato pelting, Mrs S instituted a new feast in the calendar of her domestic church: the feast of the Penitential Potatoes. Afterall, seeing one’s mother hit on the head by a potato apparently flung from heaven is one of the more vivid spirtual lessons a child can have. C still remembers it, and R and N have heard the story, and the explanation. The Feast of the Penitential Potatoes will be like a little lent the day before the great Feast of the Nativity of Mrs S. On this day of penance they shall dine on potatoes and whatever else is available in the fridge. And if they have not the cheese, or sausages, or beans they wanted, they shall not whine and swear. They shall practice manners and gratitude. They shall be reminded of the universal call to conversion, of the need for repentance and continuing formation in virtue. At least, that all seemed like a good idea to Mrs S when she realised that once again on the 22nd of September she had no idea what to cook for dinner. But this time there were potatos in the pantry, and she thought it was best just to get on with cooking and not pester Heaven with the problems she created for herself through her lack of domestic virtue.